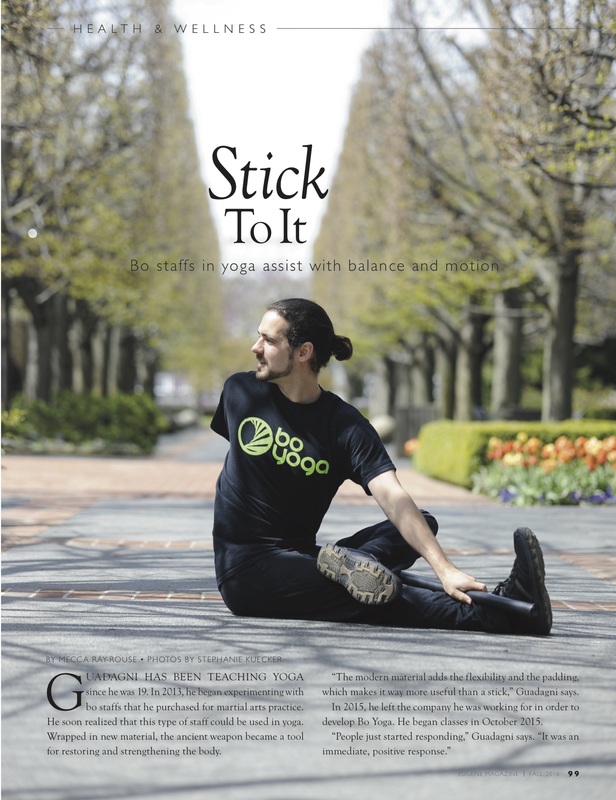 “Let the bo staff do the work,” Nate Guadagni, founder of Bo Yoga in Eugene, says to his students Thursday morning. Framed in white Christmas lights, a mirrored wall reflects Guadagni’s students—each with a flexible and padded bo staff. Guadagni has been teaching yoga since he was 19. In 2013, he began experimenting with bo staffs that he purchased for martial arts practice. He soon realized that this type of staff could be used in yoga. Wrapped in new material, the ancient weapon became a tool for restoring and strengthening the body. “The modern material adds the flexibility and the padding, which makes it way more useful than a stick,” Guadagni says. In 2015, he left the company he was working for in order to develop Bo Yoga. He began classes in October 2015. Guadagni’s three pillars for Bo Yoga are energy, balance, and mindfulness. At the beginning of the class his students focus on loosening up the upper body, where people tend to hold most of their stress. Working from head to toe, Guadagni leads his classes through a series of stretches, core work, and balance poses, ending with meditation. During a pose, students use the bo staff for balance or support, or as a way to deepen the stretch by allowing the muscle to relax. With the bo staff, yoga is more accessible to people who need extra support for safety. “I want Bo Yoga to feel inviting,” Guadagni says. Yoga can be too demanding, challenging, or intimidating for some people. Guadagni’s class is designed to be fun, uncompetitive, and very beneficial. “You’re going to get a mixture of the challenge that the body needs to build strength, balance, and flexibility, with the support that’s needed to make sure you’re doing it safely, effectively, and easily,” Guadagni says. Students attend Guadagni’s class because of their interest in physical and emotional well-being. Though Bo Yoga primarily offers a physical benefit, it also offers an emotional benefit through regulated breathing. Many of Guadagni’s students have experienced these benefits since beginning Bo Yoga. A few of his students who came to his first class in October have become regulars. “I get things here I don’t get at other places,” Hazel Jones says. She had never taken a yoga class before starting Bo Yoga in October. She likes that Bo Yoga focuses on breathing, balance, and being aware of outside factors. Guadagni also offers an instructor course for those wanting to obtain a license to teach Bo Yoga. He hopes the Bo Yoga staff will become a staple in every yoga class. In the meantime, Guadagni will keep developing his practice and expanding the bo’s use. “I’m excited to see where it ends up,” says Guadagni. Guadagni currently teaches Bo Yoga at Eugene Yoga.